ON SALE! 4 Packs of Live Maine Lobsters! Home > 12 Packs Of Lobsters! > Land O' Lakes Butter > Fresh Lobsters! > Live Lobster 4 Packs! You save BIG when ordering a 4 pack! Our Four Packs Of Live Maine Lobsters Are A Perfect Gift, Or For A Special Dinner Party At Home! We'll Hand Select Four Fresh Hardshell Maine Lobsters, Pack Them Up And Ship Them Fresh Overnight, Just For You! 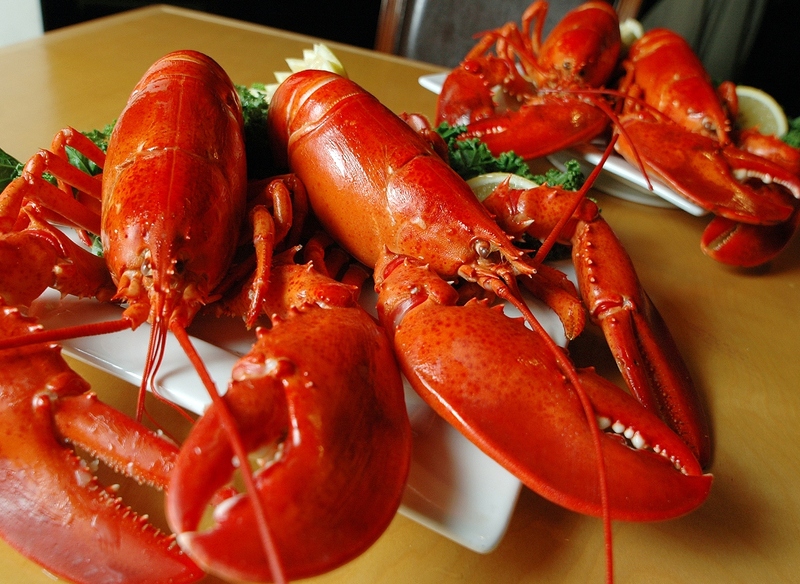 Order Live Maine Lobsters Four Packs By 10am EST, And Enjoy Them For Dinner Tomorrow! Lobsters Also Make A Great Gift Idea For Your Favorite Seafood Lover! How Easy Is That! A friend in CT purchased a 4-pack of 1 1/4 lb lobsters for us for Xmas. The lobsters were still feisty when they arrived and delicious that same night when we steamed them. Living in FL now we don't get the opportunity for a fresh Maine lobster too often. We would definitely order from the Lobster Guy again!! Having grown up in Maine I appreciate fresh lobster and living in Texas makes it hard to come by! Lobster were delivered well packed and fiesty, shells were hard. Darn fine lobster! wish I could give you 10 claws up! what a treat to have LIVE lobsters delivered to my door. fresh, sweet and delicious like were on the coast. yum! We received our 4-pack of very lively lobsters yesterday. They were delicious and incredibly meaty. I have never before felt completely full after eating a single 1.5 pounder. My daughter sent me a gift for my birthday on Feb. 12 of 4 2-1/2-3# lobsters....they were WONDERFUL. So full of meat! Me and my family absolutely would purchase from your company again. Thank you for sending a first class product. I ordered lobsters for Thanksgiving, which coincided with my husband's birthday. The lobsters were delicious. they were packed perfectly, there were instructions on how to deal with them (refrigeration and cooking), and the person who took my order couldn't have been any nicer. I'd definitely use them again. They really know what they're doing. There are more than a few places to get lobsters shipped nowadays, but this guy is the REAL DEAL! Best Lobsters We have had, even better than sitting at a picnic table in Bar Harbor! Great Job Tim, It's so nice to see someone who runs a first class business and have a first class product be such a nice guy! It was a pleasure to speak with you! I order 2 2-packs of 2-1/2 lobsters in June for my daughter's 40th birthday. I live now in GA and she lives in Wisconsin. I was born in Bar Harbor and grew up in Trenton. Needless to say she was absolutely thrilled. She and the grandchildren had a feast for several days and absolutely LOVED them. She even took pictures with the grandchildren holding their lobsters and shared them on facebook. The lobsters arrived on time and were absolutely delicious. I will definitely buy only through you folks. Great price, great service and great / fresh lobsters! My two sisters, younger brother and I sent our older brother 4, 2-21/2 lib lobsters for his 75th Birthday. He lives in California and hasn't had lobster in 40 years. Everything went as planned. His wife cooked then following the enclosed instructions and thoroughly enjoyed their dinner. We are all happy to have given this gift and will do it again when a lobster occasion arises. We will be back. Though we live in Arizona, for one special evening, we felt like we were on the East Coast. That is how fresh and delicious the lobsters were. Great value to boot! These were the best lobsters we have ordered! Arrived fresh, and packaged with care! This guy knows what he is doing, and the attention to detail shows. We will order again soon. We ordered a four pack of two pound lobsters. They arrived perfect, cold and happy. What a feast we had, and I cannot thank you enough Tim for what a great job you do. Shannon was excellent from start to finish with our order. We will be back soon. We got our lobsters today at 3:30 and by 6:00 we had eaten some of the finest shellfish in anyones book. Tomorrow we have fresh mussels , steamed in garlic and beer, on linguine, with fresh garlic toast ! ! ! ! ! ! We hope to use your services again in the near future. Retired USAF and Amateur radio enthusiast..
We received our lobsters this morning and just finished our feast. They were sweet and delicious! We have been missing fresh seafood since we moved to NC from Maine 10 years ago. Now we have found the best place to get it fast and at an affordable price. Thanks again for your great service and awesome lobsters. Next time Ill order the Chowdah too! They arrived on time and very much alive. I have ordered "on line" lobsters in the past and these were by far the best! After a recent car trip through New England, we wanted to try a shipment of lobsters. We ordered four 1 1/2 pounders. They were delicious. The ordering process is a breeze, the price is right, they were delivered alive and on time, packed very well. We've recommended The Lobster Guy to family and friends. We ordered Lobsters Oysters and Steamers this week. It was nice to fine a variety of Oysters. We enjoyed the Matunucks the most. This site has nice options as far as ordering goes. We saw Capt, Tim on the Discovery Channel and decided to give him a try. Honest prices and great products. We were impressed with everything. Dana T.
We ordered 4 lobsters for moms birthday. They came expertly packed, on time, cooking directions, and a nice handwritten thank you note from Megan! Where else to you get handwritting thank you's anymore? We were impressed to say the least. Oh, and the lobsters were Fabulous!